If you don’t want the hassle of a heavy boat dock and a unique visual appeal, consider choosing a vinyl dock. Our sturdy vinyl options are a great alternative to the usual wood or aluminum docks and give you everything you need and more. If you’re getting frustrated with the amount of water and sand ending up on your dock, don’t worry! Vinyl docks have a flow through chevron pattern that provides small openings in the dock’s surface to make sure nothing lingers. 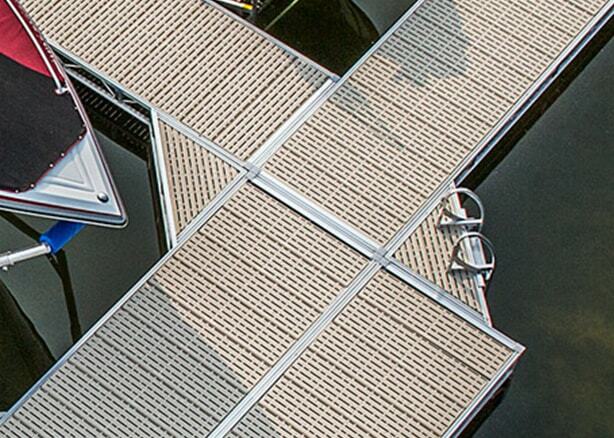 This also allows sunlight to penetrate the dock, keeping it cool on your feet.